Over time, two species may further diverge or reconnect, depending on the fitness strength and the reproductive barriers of the hybrids. After speciation, or sufficient evolutionary change for one species to become two distinct species, the two species may continue to co-habitate and interact. The area in which two closely-related species interact and reproduce is known as the hybrid zone; their offspring are known as hybrids. Depending on the fitness of the hybrid offspring relative to the parents, the two species may either stay as two distinct species (reinforcement), or become one species again ( reconnection ). Speciation occurs over a span of evolutionary time. When a new species arises, there is a transition period during which the closely-related species continue to interact. After speciation, two species may recombine or even continue interacting indefinitely. Individual organisms will mate with any nearby individual with which they are capable of breeding. An area where two closely-related species continue to interact and reproduce, forming hybrids, is called a hybrid zone. Over time, the hybrid zone may change depending on the fitness strength and the reproductive barriers of the hybrids. Speciation and the Hybrid Zone: After speciation has occurred, the two separate-but-closely-related species may continue to produce offspring in an area called the hybrid zone. 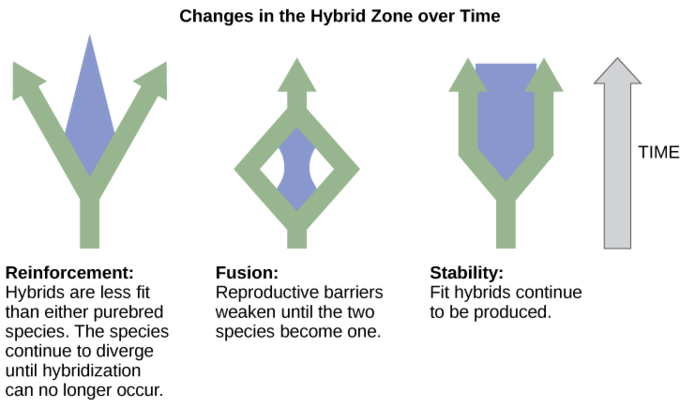 Reinforcement, fusion, or stability may result, depending on reproductive barriers and the relative fitness of the hybrids. Hybrids can have less fitness, more fitness, or about the same fitness level as the purebred parents. Usually, hybrids tend to be less fit; therefore, reproduction to produce hybrids will diminish over time, which nudges the two species to diverge further in a process called reinforcement. This term is used because the low success of the hybrids reinforces the original speciation. If the hybrids are less fit than the parents, reinforcement of speciation occurs, and the species will continue to diverge until they can no longer mate and produce viable offspring. If the hybrids are as fit or more fit than the parents, or the reproductive barriers weaken, the two species may fuse back into one species (reconnection). For a hybrid form to persist, it will generally have to be able to exploit the available resources better than either parent species, with which, in most cases, it will have to compete. Over time, via a process called hybrid speciation, the hybrids themselves can become a separate species. Reproductive isolation between hybrids and their parents was once thought to be particularly difficult to achieve; thus, hybrid species were thought to be extremely rare. With DNA analysis becoming more accessible in the 1990s, hybrid speciation has been shown to be a fairly common phenomenon, particularly in plants. Scientists have also observed that sometimes two species will remain separate, but continue to interact to produce some hybrid individuals; this is classified as stability because no real net change is taking place. For a hybrid zone to be stable, the offspring produced by the hybrids have to be less fit than members of the parent species. Two patterns are currently observed in the rates of speciation: gradual speciation and punctuated equilibrium. In the gradual speciation model, species diverge slowly over time in small steps while in the punctuated equilibrium model, a new species diverges rapidly from the parent species. The two key influencing factors on the change in speciation rate are the environmental conditions and the population size. Gradual speciation is most likely to occur in large populations that live in a stable environment, while the punctuation equilibrium model is more likely to occur in a small population with rapid environmental change. Scientists around the world study speciation, documenting observations both of living organisms and those found in the fossil record. As their ideas take shape and as research reveals new details about how life evolves, they develop models to help explain rates of speciation. In terms of how quickly speciation occurs, two patterns are currently observed: the gradual speciation model and the punctuated equilibrium model. In the gradual speciation model, species diverge gradually over time in small steps. 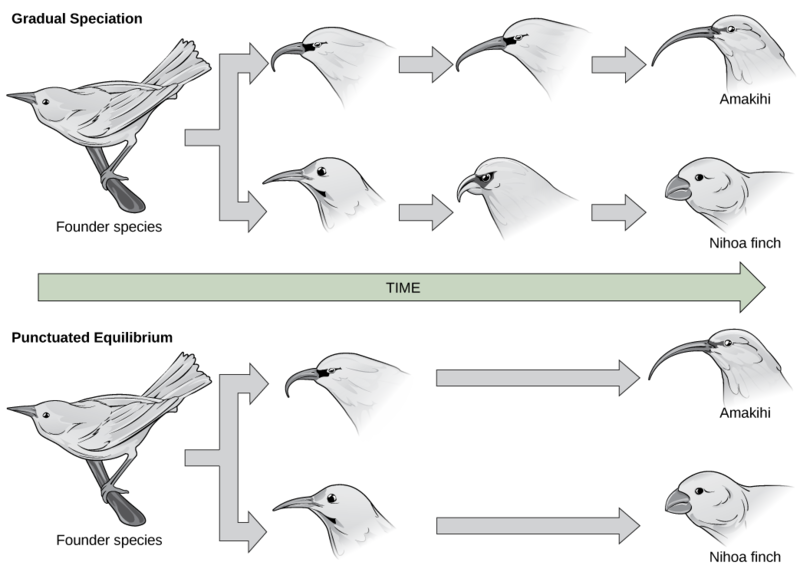 In the punctuated equilibrium model, a new species changes quickly from the parent species and then remains largely unchanged for long periods of time afterward. This early change model is called punctuated equilibrium, because it begins with a punctuated or periodic change and then remains in balance afterward. While punctuated equilibrium suggests a faster tempo, it does not necessarily exclude gradualism. Graduated Speciation vs Punctuated Equilibrium: In (a) gradual speciation, species diverge at a slow, steady pace as traits change incrementally. In (b) punctuated equilibrium, species diverge quickly and then remain unchanged for long periods of time. The primary influencing factor on changes in speciation rate is environmental conditions. Under some conditions, selection occurs quickly or radically. Consider a species of snails that had been living with the same basic form for many thousands of years. Layers of their fossils would appear similar for a long time. When a change in the environment takes place, such as a drop in the water level, a small number of organisms are separated from the rest in a brief period of time, essentially forming one large and one tiny population. The tiny population faces new environmental conditions. Because its gene pool quickly became so small, any variation that surfaces and that aids in surviving the new conditions becomes the predominant form.